Trails of all lengths, heights, and terrains wind and climb through the Smokies, but only one is aquatic: the Western North Carolina Fly Fishing Trail. The insider’s guide to fly fishing highlights 15 sweet spots scattered across Jackson County where you can wade in; cast your fly; and catch brook, brown, and rainbow trout—almost guaranteed. Download the map and plot your routes along the Tuckasegee River and a half dozen smaller creeks. If you’re more novice than master fisherman, there are plenty of local guides to teach you the ropes (or rather, lines), and you’ll find a list of recommended outfitters on the site, too. 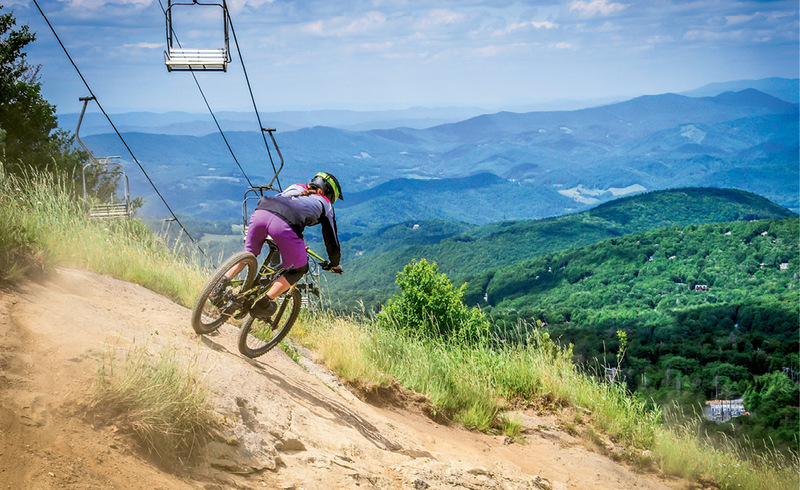 If you have plans of the two-wheeled sort, Pisgah National Forest is your best bet for white-knuckle thrills. “The size of Pisgah, more than 500,000 acres, makes it an endless playground for mountain bike adventures. Pisgah remains raw and natural, which sets it apart from new, flourishing trail systems,” says Sam Salman, owner of The Hub and Pisgah Tavern, a bike shop and watering hole on the perimeter of the national forest. The ruggedness of the trails, however, means they’re not for everyone. Newbies might consider DuPont State Recreational Forest, which is just 10 minutes away and offers purpose-built mountain biking trails perfect for beginners. Regardless of your experience level, consider The Hub your home base. Stop in beforehand to rent a bike or buy new gear, grab a map, and plan a route through the hundreds of miles of trail systems outside their back door. After a long day of riding, cool off with a pint at the Pisgah Tavern and snacks from a rotating selection of food trucks that park in the lot. Intermediate: “Rising from the shop, we recommend the looped trails around the ranger station area, including Lower/Middle Black Mountain, Upper/Lower Sycamore Cove, Grassy, and Thrift Cove trails,” he says. Like a water park without the exorbitant ticket price, Sliding Rock holds true to its name, and hundreds of visitors congregate in its carnival-like ambiance daily, eager to try nature’s slide. Take the walkway to the top of the rock, plop into the stream, then slide down its smooth face to topple into the deep basin below. 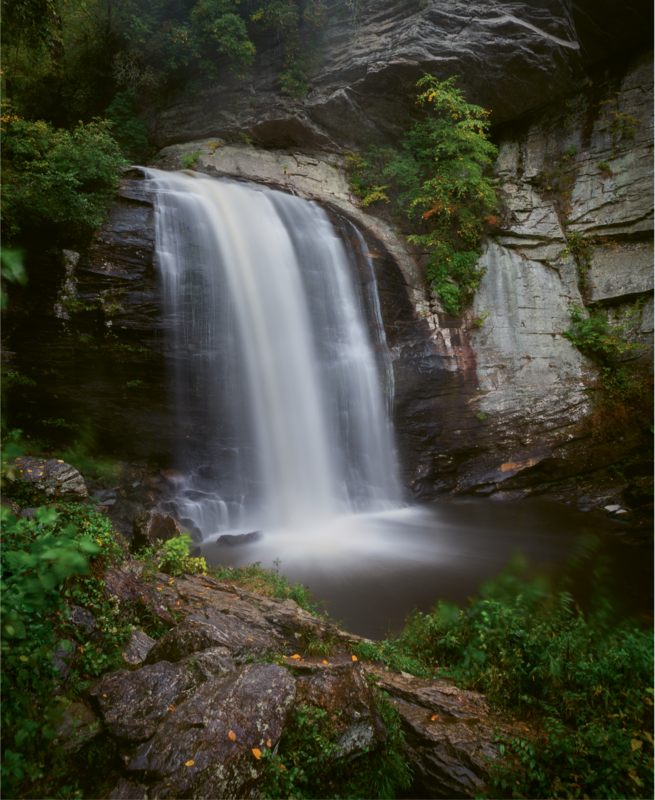 PHOTO: Looking Glass Falls is located on U.S. 276 near Brevard in the Pisgah National Forest. This tourist favorite is visible from the curving side of U.S. 276. Park the car and descend the short staircase; kids can splash in the wide pool at the base of the lofty falls. Slightly less popular (and therefore less crowded) is the equally scenic Moore Cove Falls. Grab your picnic basket and make the half-mile trek to the 50-foot falls, where you can spread your blanket in the wide hollow between the falls and the rock face. If strapping yourself into a piece of plastic and careening through rapids sounds a little intimidating to you, you’re not alone. That’s why the Nantahala Outdoor Center (NOC, which hosts the Whitewater U.S. Open Championships every March) created its Paddling School. Are you a cyclist? A sprinter? An aquanaut? Whatever your sport, the Lake Lure Olympiad has a race for you. Eight different events are spread across the three-day affair, anchored by Friday night’s 10K Dam Run, Saturday morning’s Lake Lure Triathlon, and Sunday’s Race to the Rock 5K Run or 25-Mile Bike to the peak of Chimney Rock. The most avid athletes boast of completing “three races in three days,” and earn the medals to prove it. Even the little guys can get in on the action with Saturday’s Junior Olympiad, where they win medals in activities like an obstacle course, 40-yard dash, and broad jump. Arrive in time for Friday night’s Opening Ceremony, a nod to the Olympian tradition with a Lighting of the Torch and—because it’s summertime in the Carolinas—an ice cream social. With Lake Lure’s stunning scenery and the charming neighbor town of Chimney Rock offering kitschy shops and mini-golf a few miles away, you might want to extend your stay beyond the Olympiad. PHOTO: Get a bird’s-eye view of the Blue Ridge at Navitat. Ziplining is arguably at its best high amidst the trees of WNC. Careen over the dense canopy of Bardnardsville’s Navitat and get an epic view of some of the most scenic spreads in the region. On the “Blue Ridge Experience” ($100), zippers soar between mountain peaks, and parallel lines mean you can zip and squeal alongside your family members at speeds up to 65 miles per hour down lines as long as three quarters of a mile. The “Moody Cove Adventure” ($100) includes wobbly, swinging bridges and a spiral tree staircase. For a full day of fun, combine the two with the “Ultimate Adventure Package” ($170). 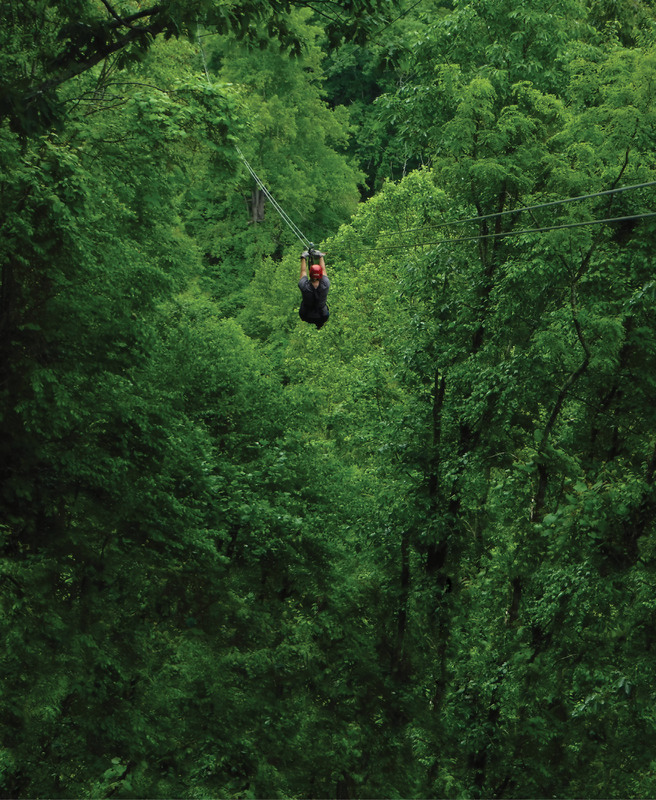 The most avid thrill seekers should head south to The Gorge Zipline in Saluda. This park boasts a wealth of superlatives, including steepest and fastest ziplines in the country. In the heart of old-growth forests, you’ll descend 1,100 feet at breathtaking speeds, surrounded by 18,000 acres of protected Green River Gamelands. In the genre of saddles and spurs, there is an equestrian event Olympic in scope: the World Equestrian Games (WEG). Like the Olympics themselves, the WEG are held in new cities in four-year cycles, and 2018’s event will be in Mill Spring on the sloping edge of the Blue Ridge from September 11 to 23. The Games combine eight events, including jumping, dressage, eventing, driving, endurance, vaulting, and reining, over 13 days of fast-paced competition. Spectators fill the stands to watch human and horse work together in tandem; when the ring empties, they flock to equestrian-focused demos and exhibits to learn more about the art behind the show. Hosting this year’s WEG, the Tryon International Equestrian Center is a bustling horse hub for WNC. Select Saturdays through the summer, visitors convene in the arena for Saturday Night Lights, a free, family-friendly Grand Prix equestrian event with competitive show jumping, plus food, face painting, carousel rides, and live music. Stay in the on-site lodging (at the Stable House Inn or in a cozy cabin) and you’ll be a quick jaunt from the show grounds, where events as varied as Gladiator Polo and dressage occur almost daily. The French Broad River cuts through the mountains like a tidal nymph, beckoning sweaty revelers to cool off in its waters. It’s an aquatic haven for all sorts of activities, like paddle boarding, kayaking, rafting, and the lazy man’s sport: tubing. Though you’ll find outfitters scattered along the banks of the Broad, including the brewery-lined straits of Asheville, if you want to plop in a tube and drift away in undisturbed tranquility, head to Hot Springs. “It’s one of the prettiest sections of this river,” proclaims Rodney McCall, a native of the area and proprietor of Hot Springs Rafting Co. Whereas other outfitters shuttle some 60,000 floaters down the French Broad every year, McCall sends just 600 down his two-hour-long stretch of river. And here, unmarred by the bigger cities’ proclivities, nature is untouched and bountiful, offering tubers a glimpse at wildlife such as turtles and the occasional bald eagle. After your trip, the rafting company’s shuttle delivers clients, sun-drenched and satiated, back to their cars.